Since The Will To Live Foundation was formed in late 2010, it has continually committed itself to achieving its overall mission of working with and through the kids of our communities, always encouraging them to recognize the true love that exists in their lives today in the form of their friends and Life Teammates. As a result, the Foundation hopes that these young adults will improve not only their communication with each other, but in turn, their Will To Live. 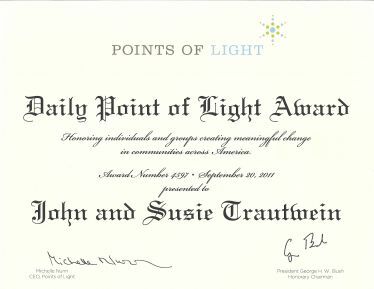 After hundreds and hundreds of speeches to kids, parents, coaches and teachers – along with several annual events and fund raisers organized by the kids – the Foundation’s founders, John and Susie Trautwein, have recently been awarded President George H.W. 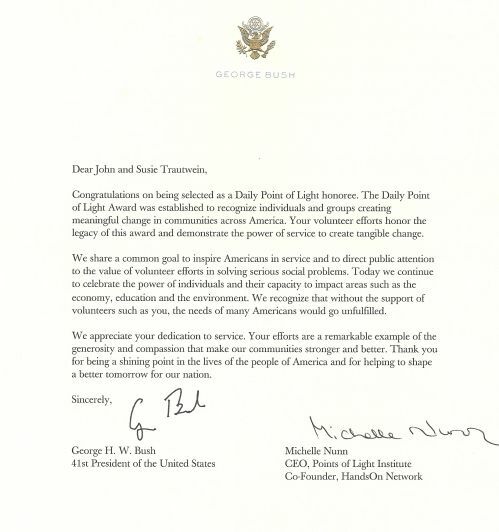 Bush’s Daily Point of Light Award. An Award For The Kids, Through The Kids, By The Kids! The Will To Live Foundation, is a recognized 501(c)(3) public charity. ← An army of kids, some 700 strong, spread the “love ya man” message of the Will To Live Foundation!